We are based in Delhi. We provide service to people all over the world, so whether you are in India, USA, Switzerland, Australia, Singapore or anywhere else, you can take advantage of our trustworthy services. We have helped 1000+ people to get their pension refund. You can contact us by email, phone. You can contact us personally in Delhi. For pension refund related questions, comments, or suggestions please use following online form. 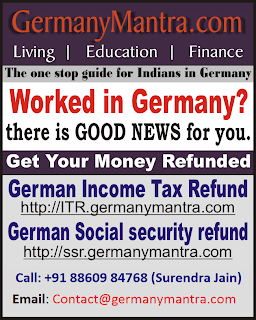 But if you want to apply for German Income Tax refund, then fill the form here.